Bard StatLock Dialysis Stabilization Device provides suture-free stabilization for short-term dialysis catheters. 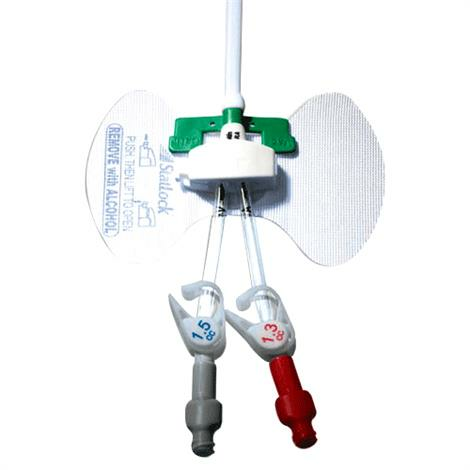 It features a releasable proprietary retainer and an anchor pad to securely and comfortably hold the catheter in place. This method is more effective alternative to tape in helping improve clinical outcomes, quality of care and economic efficiencies. How to use StatLock Stabilization Device? Why use StatLock Securement Device? A releasable proprietary retainer with an integrated, advanced-technology adhesive core. - Cleanse and degrease insertion and securement site with ChloraPrep solution, alcohol or per hospital policy and procedure. Allow to dry completely. - Insert catheter and connect extension set per manufacturers direction for use. - Apply skin protectant provided to securement site. Allow to dry completely (10–15 seconds). - Apply Tincture of Benzoin. Allow to dry "tacky dry". - Always secure the catheter to the StatLock device retainer before applying the adhesive anchor pad on the skin. 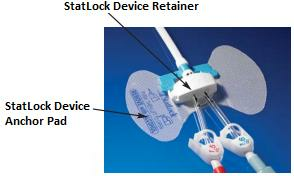 - Press the catheter hub into StatLock device retainer. - Peel away the StatLock device paper backing one side at a time, then place on the skin. - Apply transparent dressing per hospital policy and procedure. Always place the sterile adhesive strip over catheter at or near access site when performing StatLock Dialysis stabilization device dressing change. - Remove transparent dressing using the stretch technique. - Open StatLock device retainer by pressing and lifting release button with the thumb. - Carefully lift catheter from the retainer. - First, lift the edge of anchor pad using 3–4 alcohol pads. Then continue to stroke undersurface of the pad with alcohol to dissolve the adhesive as pad slowly lifts away from the skin. - Do not pull or force pad to remove. Do not use the StatLock device where loss of adherence could occur, such as with a confused patient, unattended access device, diaphoretic or non-adherent skin, or when the access device is not monitored daily. Observe universal blood and body fluid precautions and infection control procedures, during the StatLock Dialysis stabilization device application and removal. Suture the anchor pad to skin if necessary or deemed necessary. Avoid the StatLock securement device contact with alcohol or acetone, both can weaken bonding of components and the StatLock device pad adherence. Minimize catheter manipulation during application and removal. Remove oil and moisturizer from targeted skin area. The StatLock catheter securement device pad adherence and catheter/tube position should be routinely inspected. Orient the StatLock Stabilization Device so arrows point toward the catheter tip. The device should be replaced every 7 days. A luer-lock connector must be used to secure venous and arterial catheters. Always apply the adhesive strip to central venous and arterial catheters at or near the insertion site when using a StatLock Dialysis catheter stabilization device. This is a single-use device. Reuse/and or repackaging may create a risk of patient or user infection, compromise the structural integrity and/or essential material and design characteristics of the device, which may lead to device failure, and/or lead to injury, illness or death of the patent. Do not re-sterilize. The sterility of the single-use device is not guaranteed following re-sterilization because of an indeterminable degree of potential pyrogenic or microbial contamination which may lead to infection complications. Re-sterilization may compromise the structural integrity, essential material and/or design characteristics and may lead to an unpredictable loss of functionality and/or device failure. Do not use alcohol or acetone containing products on pre-term infants.